Italian astronomer and Dominican friar Giordano Bruno (1548–1600), found guilty of heresy by the Roman Inquisition and burned at the stake, has long been an enigma of early modern European philosophy. His central 1586 work On the Heroic Frenzies has shown a particular need for a fresh examination. This vibrant bilingual edition, annotated by celebrated Bruno scholar Ingrid D. Rowland, features the text in its original Italian alongside an elegant, accurate English translation. 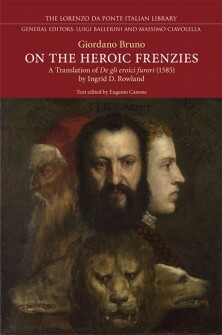 On the Heroic Frenzies is at once a philosophical dialogue, an anthology of love poetry, and a collection of sonnets, songs, and emblems – sometimes borrowed from other writers, but primarily Bruno’s own. Rowland’s detailed introduction and extensive footnotes highlight the philosophical sources, Biblical allusions, and biographical elements that make Bruno’s work both richly conceived and often challenging to understand. Providing cohesive insights into Bruno’s text, Rowland’s edition of On the Heroic Frenzies is a helpful guide for those new to his work.